I tried to get a “homebrew” infrared receiver attached to the DCD line of a serial port working on Ubuntu Bionic. It seems that things have changed since Ubuntu 12.04, when I last had it working. $1 microcontrollers, pfft. What useful ones are around for under 50 cents? I tried drawing the schematic for the common “Bustophedon” electronic speed controllers (ESC) for brushed motors. This is the FlySky iBus protocol that I’ve gleaned from a blog post and a single library. Here’s how I’ve checked that my flash memory (USB stick, SD card etc) isn’t fake. The idea is to use a cipher to produce a psuedorandom stream, write its output to the flash memory, then genenrate the stream again comparing it to the card. I like to use VMs when doing things which might put stuff all over the filesystem or needs root access to install. But at a few gigabytes each they quickly take up space. I managed to use the live CD image as a base, which is compressed and can be shared among virtual machines. I recently purchased a Huawei Mediapad 7 Lite 4GB very cheaply on clearance. It’s based on a Rockchip RK2918, which there are tools for to read and write the flash directly. Before I start trying to hack it, I should get a backup of what’s already on it. Can you make a Z-machine console - a virtual machine for text adventure games - complete with screen and keyboard on an AVR? For Science Alive, I made a simple circuit that made noises in response to light changes. Being something which makes noise it was popular with the kids. It’s based on circuits described in Nicolas Collins’ “Handmade Electronic Music”. A few people asked me a circuit so I’ll describe it here. This is work in progress, so there’s plenty of gaps! I purchased a quantity of cheap laser modules for a project. They were advertised as 3V modules, but they all have 39Ω resistors in series for current limiting. When connected to two AAA batteries, I measured 15mA and a forward voltage of 2.15V. This makes the resistor value 0.85V/15mA=57Ω though. I’ll need a simple circuit to mix my video signals together. The Arduino TV Out library shows how to do this, but that works with 5V IOs, but the STM32L Discovery (and all ARM chips AFAIK) uses 3.3V. Here’s the first drawing from my whiteboard robot! It doesn’t draw anything by itself because I must have messed up the maths, but I was able to operate it manually and draw some circles. The lines are wonky because the wall the board was attached to was shaking. I didn’t get the pen to move in and out, to draw separate lines. 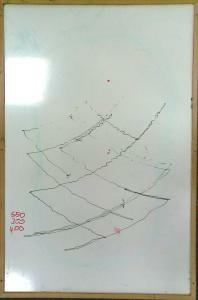 I’m thinking of building a robot that suspends a whiteboard marker from two strings, and draws on a whiteboard. There would be two motors that can change the length of the strings. Problem: the trackball scratches my graphics tablet! A while ago I had the idea of using cheap bluetooth modules to operate an Arduino from a mobile phone, thus saving the expense of an IOIO board (or similar). I purchased the module, but it didn’t arrive during a period of unemployment and I never got around to doing anything with it. This article describes how to run one of the V-USB demos on an AVR stick (which is an Easylogger clone). My cheap kettle leaked. You couldn’t press the lever down when it wasn’t on the base, so I hoped to find an electromagnet which held the switch on when it had power. I didn’t find one (I only managed to salvage two neon lights from it), but I found out how kettles switch off when they’re boiling. I pulled the mirror out of a laster pinter, and I had a go making it work. How I repartitioned a hard disk that has all four primary partitions allocated. Well, not really offline since you’ll still have to download some files, but not all of the packages. Use this for computers with limited internet quota. I’m sure this could be done in a single script with some awk-fu. Oscilloscopes are expensive. USB ones are too. I reckon one can be built for under $50. I heard about a simple circuit the other day that can light an LED of as little as 0.3V or even a lemon. This page analyzes it in loads of detail, and suggests adding a capacitor and diode to improve the circuit’s efficiency considerably. I use my printer about twice a year. I went to use it the other day. The ink was dry. What type of printer will work when I want? I purchased a USB to serial converter, popped it open and observed the two chips inside: a PL-2303HX USB to Serial Bridge Controller for a USB to TTL serial converter, and a ADM211 for converting those TTL levels to RS232 levels. Which is fine if you wanted to actually talk RS232.